There's something great about knockout tournaments, especially involving teams that are completely unfamiliar with each other. NCAA March Madness and the World Cup are perfect examples; seeing your favorite team play against a relative unknown like Murray St. or Ghana carries a little extra intrigue than your average game against a conference opponent. For MLS fans, CONCACAF Champions League embodies this opportunity. Increasingly, CCL has been painted as an MLS vs. Liga MX referendum, one in which MLS teams steadily gain but never overtake Mexico's dominant position in the region. But lost in that narrative is that CCL includes teams from a handful of other countries, too. These MLS-Liga MX matchups will get the majority of publicity (starting with Sporting KC-Toluca in the first knockout round), but seven other MLS/Liga MX teams have to knock off Central American or Caribbean opponents before those glamour matchups are set in stone. If you think these first round matchups are just a formality, just ask an FC Dallas fan how their campaign went last year (spoiler alert: they lost to Panamanian side Tauro before they even got to face a Mexican team). Truth be told, last week was kind of a failure on my behalf. I trusted the data and information that was supplied by Golazo, and I'm not sure it really worked out as intended. A few mistakes have been pointed out to me, and while in general that could have been avoided by double checking the MLS chalkboard, I'm not sure that I really wanted to double check their work. This week I went straight to the Chalkboard for the data and then verified the total amount based off MLS soccer numbers. The result of the total numbers this week were a bit surprising. *Expected Goals 1.0 used for this table. 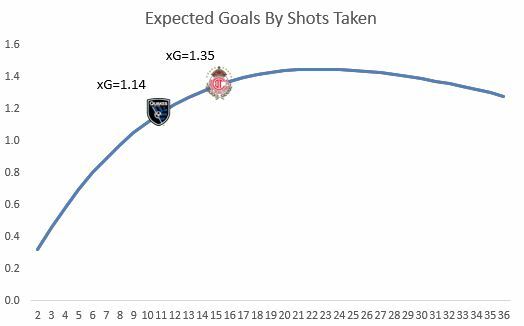 It's weird the last couple of games (talking the CCL match against Toluca midweek); San Jose has done an incredible job at generating shots against talented opposition. 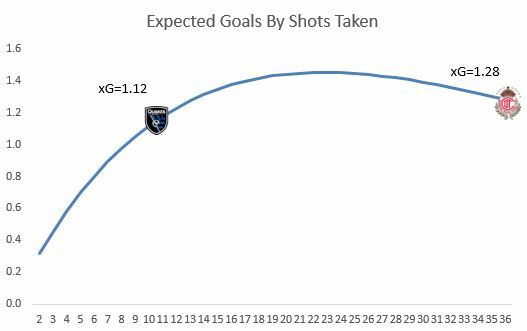 First, against a very talented Deportivo Toluca that currently sits second in the Clausura 2014 table, the Quakes managed to put together 20 shots. Liga MX isn't what they once were to MLS, but this is a very efficient showing. With that they barely squeaked by with a draw. This weekend was a much different story as they put the pedal to the floor and crashed through Real Salt Lake to draw a game they really had no business even being in to that point. Portland is another team that stood out, but for less good things than bad. As Chris already alluded to this morning (he stole my thunder! ), they've had an incredible amount of shots that have been blocked even before they get to the keeper. They're obviously getting into advantageous locations and taking shots, but their opponents are getting out in front and deterring those attempts. Which, if you were going to deploy a method for the stopping the Timbers' offense, that would seem to be it. Stay in front of them and prevent as many shots from occurring as possible. Portland has shown itself to be a terribly direct team. As you saw last week, our metric predicted under the total amount of goals scored and this week we were actually over. Again this speaks to the strength of long-term averages, and you're frequency going to be bouncing around the total amount. But the important thing is that we're close, and that we understand where we came up short and where we went over. New England, Vancouver and FC Dallas are all clubs that were lucky to even make the "50%" cut off because they just barely projected for a goal. But that was because we round up to the nearest whole number. New England was surprisingly the highest of the three clubs. I say surprising because they tallied the least amount of shots. Despite that they managed a couple of better shot locations. Lastly we have attacking third passing data. As you see, there were only two clubs over the "100" mark this week. Seattle and Philly both collected a large percentage of the total possession, which as we have talked about previously isn't necessarily what's important. It's about WHERE you possess the ball. Well, for Philadelphia it worked out well as they pretty much dominated New England. Pushing the ball into the attacking third, the Zolos limited the total touches of New England in dangerous locations and created plenty of opportunities for themselves. However, Seattle is a different story. 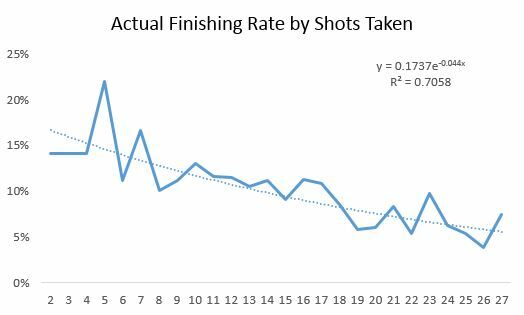 As shown in PWP, they dominated a lot of the raw numbers and even managed to finally produce a goal despite shot frustrations. But Toronto preyed on the counter attack and mental mistakes by Marco Pappa. They didn't need many chances, but in the future we'll have to see if they can continue to finish as efficiently as they did on Saturday. They sported the least amount of attacking touches in all of MLS with only 34 and while that obviously doesn't correlate 100% to goals scored, the more opportunities you have the more likely you're going to find the back of the net. Like a hot new boy band busting onto the music scene, the Portland Timbers came out of nowhere last season to improve more than any other MLS team, jumping from an eighth-place Western Conference finish and 34 points in 2012 to first place and 57 points in 2013. Expectations are high for 2013 Coach-of-the-Year Caleb Porter, and we will soon see which member of the band the Timbers are; a legitimate talent with true staying power like RSL, the Galaxy and JT, or the goofy one that is just along for the ride, like 2007 ChivasUSA, 2010 FC Dallas, and Chris Kirkpatrick. Do the Timbers have a model that will let them hang with the big boys, or will they regress to the mean with a vengeance? ASA readers see them as Nick Carter material, with a majority of voters picking the Timbers to win the Western Conference for a second season in a row. 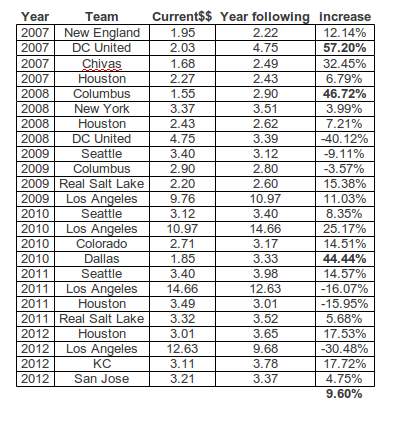 Roster Churn: Portland returns 82.31% of their minutes played in 2013, 6th most in MLS. Coming off their first place Western Conference finish in 2013, the Timbers’ theme for the 2014 offseason has been “more of the same”. Led by new coach Caleb Porter and MLS Newcomer-Of-The-Year Diego Valeri, the Timbers were a surprise contender in 2013. Porter's 4-5-1/4-3-3 hybrid system was a 180% turn from their philosophy under former coach John Spencer, and it brought the team immediate success. By controlling possession and maintaining the defensive pressure even in the opposition end, the Timbers brought a unique style that was both entertaining and effective. This attack based system saw them finish with the third most goals in the league last year, despite being only 9th in attempts. Not only were their attacks fruitful, they were dangerously efficient. Unlike last season’s roster overhaul, Portland made few big changes in the offseason for 2014, instead solidifying their depth and bringing in two Argentine veterans to shore up the back-line and attacking corps. Clearly, the Timbers are willing to ride Goalkeeper-of-the-Year Donovan Ricketts and playmakers Diego Valeri and Darlington Nagbe in the upcoming season. As in 2013, Valeri and Nagbe will be relied on to be the catalysts for the Portland offense. Led by their 12 and 10 goals respectively, the Timbers finished with the fourth best finishing rate (goals divided by attempts) in MLS last season. Being two of the most fouled players in MLS last season, and due to Valeri’s somewhat slow recovery from off-season hernia surgery, their health could determine if Portland can continue to finish with similar efficacy this season. Still, the additions of Gaston Fernandez and Steve Zakuani will alleviate some of the dependence on Portland’s playmakers. If injury isn’t an issue, the Timbers can expect to score lots of goals in 2014. The biggest (and perhaps the only) major offseason subtraction was the loss of Jamaican international and Oregon State alum Ryan Johnson’s nine goals (third on the team last year), as he pursues a career in China. The departure of Johnson will certainly be felt, but late-season acquisition Maxi Urruti had taken over the starting striker position before an injury last year, and he looks to fit perfectly into Porter’s high-pressure defensive scheme. Also significant has been the addition of “La Gata” Fernandez. Besides having the best tribute video on the internet, Fernandez will fill some of the holes left by both Johnson and Rodney Wallace, who tore his ACL in the playoffs and isn’t expected to return until late summer. Fernandez is versatile as an attacking midfielder/forward, and seems likely to assume a utility role on the Left side of Midfield to start the season. Zakuani is an unknown quantity after excelling for the Sounders before enduring two years of injury and disappointment. Few things would be more welcome to Timbers fans than seeing a former Seattle player return to form in Portland, so any significant contribution from Zakuani will be considered a bonus. Couple those additions with first-round SuperDraft pick Schillo Tshuma, who has impressed in preseason, and the Timbers will expect to continue with their high-scoring output last year. Still, requisite warnings about reading too much into the preseason aside, a lack of scoring (only 6 goals in 7 preseason games) in the lead-up to this MLS season is cause for some concern. For the Timbers system to work they'll need to score goals in bunches. 2012 Timbers Army’s player of the year Diego Chara and captain Will Johnson, who saw his career revitalized by a move to Portland last season, will again anchor a high-energy midfield that is likely to be among the league leading duos in minutes and fouls (Chara has finished in the top three in fouls committed in all three of his MLS seasons). While not as flashy as their attacking counterparts, Chara and Johnson are just as important to the Timbers’ success. Their hard-tackling, box-to-box styles are exemplary of Porter’s possession philosophy. 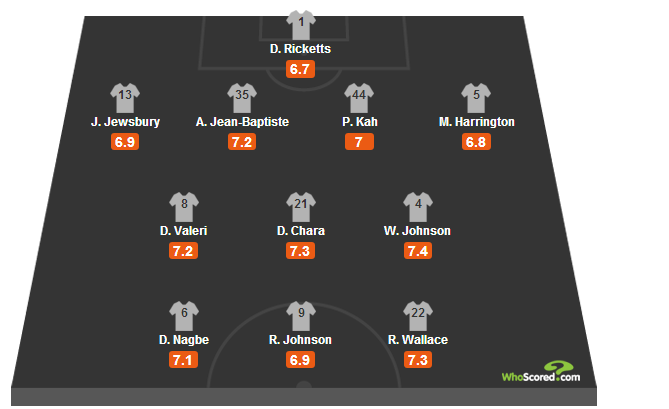 The Timbers will expect to win the midfield battle in nearly every game they play this season, with Chara and Johnson expected to neutralize the opposition’s playmakers as a way to free up and start Portland’s multi-faced attack. Despite a conference best 33 goals against last season, center back was a position in flux last year with six different players all getting starts there (Futty Danso, Pa-Moudu Kah, Andrew Jean-Baptiste, Mikel Silvestre, Rauwshan Mckenzie, and David Horst). Jean-Baptiste started the most games next to Kah, but lost his starting spot to Danso in the last couple months of the season. Still, Danso’s limitations were exposed in the playoffs last season, and priority number one for the offseason was to find a consistent starter to pair with Kah. Portland ultimately ended up bringing in contender for best-named signing of the MLS offseason, Argentine Norberto Paparatto. While little besides some YouTube highlight videos (especially dubious when judging a CB) is known about Paparatto, judging by his solid if mostly unremarkable preseason the starting spot next to Kah appears his to lose. The outside backs are likely to stay the same as they were for nearly every game in 2013, with Jack Jewsbury and Michael Harrington (fresh off a USMNT summer call-up) being active both as wing-defenders and initiators of the attack. Ricketts silenced his doubters and skeptics last year by earning his second Goalkeeper of the Year award at age 36. While not getting any younger, the Jamaican did a lot to cover up for the mistakes of Portland's defenders last year, having allowed only 83.2% of the goals a replacement MLS keeper would have, according to our goalkeeper ratings. Along with Nick Rimando, Ricketts was a head above the rest of MLS keepers, having prevented 6.27 goals more than the average MLS goalkeeper last season. Still, the Timbers appear to be grooming young New Zealander Jake Gleeson (who they have sent on loan to Sacramento Republic FC) to fill Rickett's shoes, so there will be a smooth transition when Ricketts ultimately retires. The 2014 MLS All-Star game will be in Portland, but the Timbers’ organization and fans expect MLS Cup to be held there, too. Under the guidance and leadership of Caleb Porter and Diego Valeri, year two is primed for success. With the Timbers figuring to compete in all three major competitions – MLS, the US Open Cup, and CONCACAF Champions League – this is a team that expects success. Outside of the Cascadia Cup, the Timbers have never brought any silverware back to the Rose City, but this could be the year things change. Our data suggest the Timbers drastically over performed compared their expected goals for and against last season. Did they just get lucky a season ago, or has the organization finally built a model for success? They return their three best players from 2013 in Ricketts, Valeri, and Nagbe, and hope the added experience and chemistry between these players continues to flourish. A lot is expected of the Timbers this season, and only time will tell if 2013 was a sign of things to come, or in the words of N’SYNC, it will be “Bye, Bye, Bye” for their championship hopes in 2014. 1st place in the Western Conference; 204 of 404 (50.4%) readers projected the Timbers to win the Western Conference, and 386 (95.5%) projected them to make the playoffs in some capacity. The major talking point concerning the CONCACAF Champions League, and gaining entry into the tournament, is the payroll increase that MLS affords a club that qualifies. Now, this isn't the sizable increase for a club that we see for a team in Europe, but it has the potential to be a game-changer in MLS, depending on the team and its ownership. Most figures concerning team salary/payroll are generally guarded for obvious reasons. However, rather than using official numbers, I went through the data generously provided by the Players Union and calculated the accrued difference in pay between when the team won entry and the following year after the increase. Now, as it happens, the Union only has data posted as far back as 2007, that's okay. Since the tournament underwent changes, adapting to it's current format back in 2008. Obviously, this is still a small sample size, but it gives you a rough figure on how this could help DC United and the other Champion-League-bound clubs this season. A big caveat to using the Unions' data is that its just a snap shot at a given point in the season. Not necessarily what they paid out in dues for the entire campaign. An obvious tip-off to that is Seattle dropping payroll from 2009 to 2010. They didn't cut funds, but because late in the season they traded away Freddie Ljungberg to Chicago, his cost was associated with their club despite Seattle playing the majority of his contract for the season. This is just one example among 20 unique situations. No season is the same. The LA Galaxy and their 16% cut in 2011 largely came from David Beckham's greatly reduced fee. 2013 comes and that fee is entirely off the book with his trip to PSG and the Galaxy not replacing his huge contract with another high paid designated player. Instead they signed Omar Gonzalez. Still a team gaining access to the Champions League enjoys a nice 9% raise in their annual spending, and as is the case in other leagues, dollars spent correlate to points and position in the table to some degree.